Triumph of Chaos: The Russian Civil War 1918-1921, is a two-player card driven strategic board game wherein the players assume the roles of the RED (Communist Forces) and the WHITE (reactionary forces). This epic conflict resulted in the toppling of three centuries of Romanov rule and its replacement by a totalitarian communist ideology. Set against a backdrop of the vast and spectacular Russian countryside, only the Russian winter could surpass the brutality of the fighting. Belligerents included the various Russian republics, anarchist and independence movements, adherents of the old regime, foreign contingents of volunteers and the overt intervention of the Major Powers. 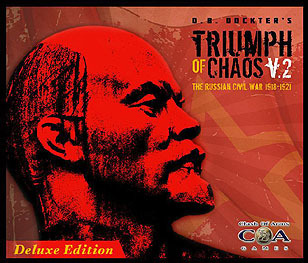 With Triumph of Chaos v2 DELUXE!, the original game published in 2005 has been enhanced to provide a richer playing experience (more Social Revolutionaries, eastern warlords and a gaggle of obscure personalities and entities), a bigger map (enlarged 40% and including the Trans Siberian rail line all the way to Vladivostok), better play aids and redesigned cards (setting the stage for more player angst). The basic structure of the original game is still there with three phases to a turn: Political (players compete to push or pull fractions to their side), Action (players alternate playing cards to move, fight, enact events and build up their armies) and Logistics (replacements and a variety of new intriguing game mechanics): Triumph of Chaos v2 DELUXE! remains the sine qua non of chaos, continuously shifting front lines and rich flavor. Here's what's in the box: a beautiful 44" x 34" double map, 220 cards (action, leader, political decks), 3 sheets of counters (including approximately 400 military units, 40+ leaders and a bundle of other game tokens), rulebook & supplement, very helpful play aids and few game bits.